Everyone is streaming some kind of media these days, and it has become central to how companies do business. Whether you stream live broadcast video events to the public or have a private video network for your organization (for example for global internal conferences, for training and lectures, and any number of other applications that weren’t even dreamt of just a couple of years ago), whether you need to seamlessly stream live content to massive or unpredictable audiences without a hitch or you need the capacity to deliver instant content from a massive video-on-demand library, there are unique challenges to each use case. This means that it is not optional for you to make sure you’ve got a foolproof streaming infrastructure in place. We’ve highlighted already that companies across industries and sectors (i.e., large media companies, car makers, healthcare companies, universities and everyone in between) have seen exponential growth in video as a significant part of their content delivery. Cisco research underscores what our experience is telling us: the overwhelming majority of IP traffic (82%) will be video by 2021. We’re already in the midst of this sea change now. Varnish Streaming Server has been deploying streaming content for leading global companies for years. Companies, such as Sky, Bell TV, RTÉ, to name a few customers who trust us to help them deliver a seamless stream and solid user experience. The only difference now is that it’s all wrapped up in a scalable, easy and flexible solution package. 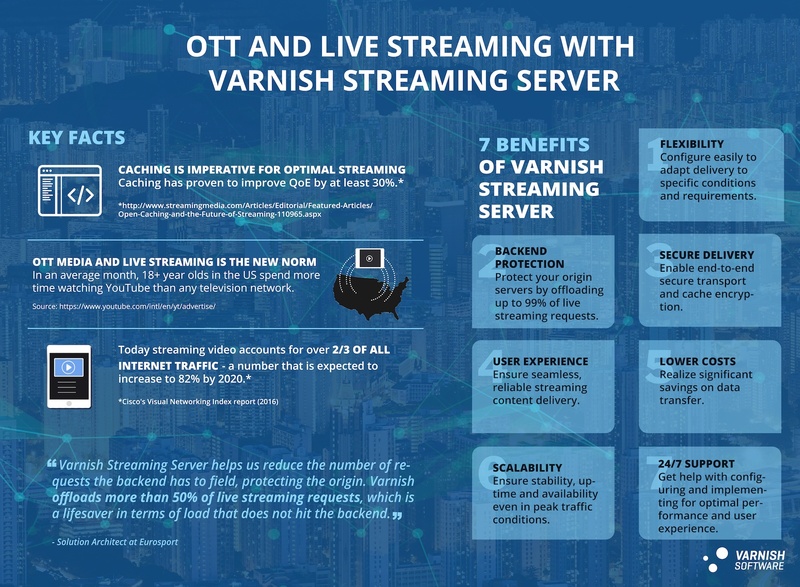 Our new website has been designed to take you right to the heart of how Varnish Streaming Server can solve your challenges and get your streaming infrastructure up and running. Plenty of materials available to deepen the story and help you get informed or more easily reach our team if you have questions or want to discuss how you can get started with streaming.